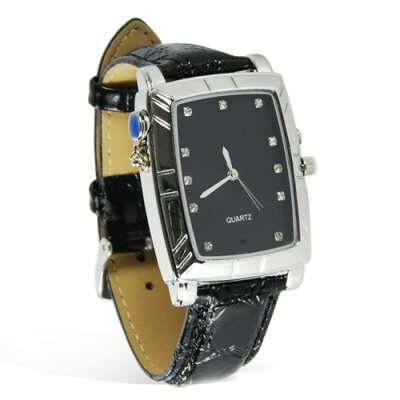 Successfully Added Stylish Watch with Leather Strap (Surveillance DVR) to your Shopping Cart. Stylish watch with leather strap for surveillance video recording without anyone knowing. This new model comes with a beautifully textured leather strap that easily adjusts to fit your wrist comfortably. With 8 GB's of built-in storage capacity, it has never been easier to record hours of surveillance in computer ready AVI format. This is the best way to record all your encounters, interviews, meetings and on the scene discussions without anyone knowing what you are doing. If you have ever had to spontaneously run into a meeting or had a sudden encounter with someone that just needed to be caught on camera, now you can instantly and secretively record that conversation for later review. This model offers you the chance to record both video and close range audio simultaneously. This is an elegent DVR " watch" solution for both ladies and gentlemen! The camera is beautifully disguised, no one will ever suspect being spied upon at all. This watch is extremely well built. I ordered it and it same much faster than expected from China. I had asked that it be sent via FedEx. It was very sturdily wrapped and it took me some time to open it but it was worth it to have it arrive safely in my mitts. The video camera produces superb clarity and the audio in it is outstandingly crystal clear. I have yet to master the pointing of the watch. You have to practice looking inconspicuous as you maintain your forearm exactly level and twist your arm outward so that the camera is properly oriented to the subject you want to capture. I still have not mastered it completely but get better each day as I practice. I would have preferred that the camera not be inside the watch face itself but rather in the front end of the watch which could be pointed my precisely. I notice that all of the watches have them in the face, however, and maybe it is not possible technically to design one with the camera in the front! This watch tell good time and no one who sees it ever examines it closely or with suspicion. I have been practicing with it everywhere I go and not one person seemed to know. It was either four or five stars I was considering so I had to give it the complete five. The value for the money is excellent. Thanks Chinavasion and keep up the good work. This is the second spy watch from chinavasion,the first one had to be returned due to a fault with the usb.I did like the chunky design of the other watch. And when it worked it was very good. But this spy watch is in a class of it's own. The looks and design of this spy watch and wrist strap.makes it look and feel like a genuine classic watch. It is very comfortable to wear.and easier to use(record button on the right facing side of the watch) Left side on the other watch.Also the camera lens is in a better position. So on to the spy aspect of this watch.The video quality is awesome,audio is also really good too. And don't forget it has massive 8gb storage,and simple file transfer via usb. on 2009-06-29 03:28:34 A lot of gadget for a small price! This covert camera watch more than delivers what it promises. The image quality from the camera is excellent even under relatively low light. The sound recording is also very good. Operations is easy and there is absolutely nothing than would make anyone suspect that this watch is a camera. The watch shows up as an extra drive under Windows Vista and works like a charm. A few things take getting used to such as positioning the watch in such a way that you capture what you want while it is on your wrist but this is a matter of trial and error. The watch is nicely finished and the leather strap is of good quality. Excellent product once again! on 2009-06-22 12:58:05 Best Fathers Day Gift Ever!!! !